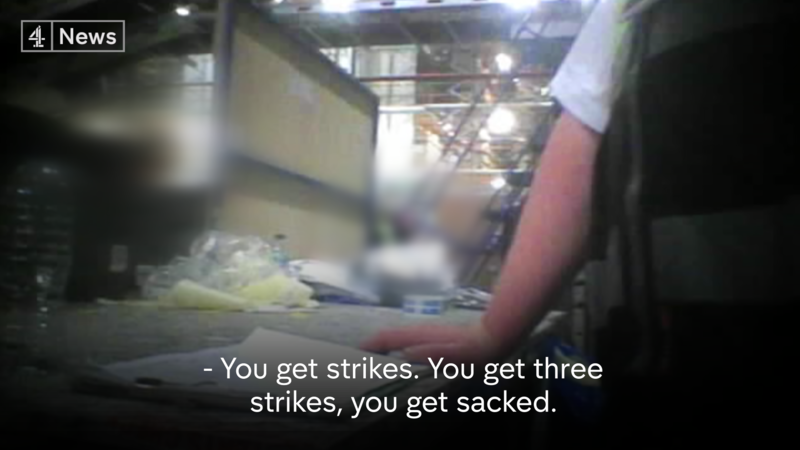 Exposed: the shocking treatment some low paid workers face at JD Sports’ huge warehouse. The undercover Channel 4 News investigation — to be broadcast on Wednesday 14th at 7pm — has revealed a litany of harsh practices at the vast JD Sports warehouse in Rochdale, including punitive disciplinary procedures, intense surveillance and security, heightened job insecurity amongst agency workers and intimidation. The temporary workers at Britain’s biggest sportswear firm claim conditions at the company are “worse than prison”, with many effectively earning less than the minimum wage and threatened with being sacked if they sit down during long shifts. The practices are taking place despite public uproar about working conditions at warehouses operated by other large retailers, including Sports Direct, Amazon and Asos. Iain Wright MP, who led the damning inquiry into Sports Direct said he was “disgusted” by the findings and said he would like the company to explain itself in front of MPs. The Kingsway Business Park facility in Rochdale, which supplies all of JD Sports’s stores in the UK and abroad, as well as its thriving online business, currently employs 1500 workers and operates 24 hours a day, 7 days a week. In September, JD Sports was named Britain’s biggest sporting goods retailer, and announced record profits that have surged by 66% in the first 6 months of the year. Meanwhile Sports Direct, which has been criticised for its own working practices, has seen first half underlying profits plummet by 57%. The company operates more than 800 stores in the UK and Europe and claims it is “a great place to work”. The investigation found many new staff taken on at the warehouse are employed through an employment agency called Assist Recruitment, which says it has been working with JD Sports for 12 years. The agency recruits are given “zero hours contracts” with no guarantee of work and are paid the minimum wage of £7.20 per hour. The contracts allow the agency to dismiss them instantly without notice. After 12 weeks of work, the agency then guarantees just 7.5 hours of work per week. One supervisor told the undercover reporter they could be disciplined if they slowed down, despite having met relentless targets set by the company. The Channel 4 News investigation found JD Sports and Assist Recruitment are operating a “three strikes and you’re out” policy at Kingsway, which can lead to staff being fired for minor infractions. An induction booklet produced by Assist Recruitment and given to all new workers refers to “strikes” as part of their disciplinary procedure. Staff and supervisors confirm that so-called “strikes” can be issued for offences including being caught with chocolates or lighters in the warehouse. Other offences include lateness, “attitude”, absenteeism and having chewing gum. Workers are told that other offences, such as having a mobile phone, can result in instant dismissal. Sports Direct was roundly criticised for operating a “six strikes” policy at its warehouse. “It’s twice as bad as it was at Sports Direct, it’s as simple as that,” said Mr Wright, who chairs the Commons’ Business, Innovation and Skills Select Committee. “If the supervisor doesn’t like the look of your face you could get a strike. It seems to be as a means to controlling the workers, and a means of coercing people into doing quite undignified things,” said Mr Wright. After viewing Channel 4 News’ exclusive footage, Mr Wright, who is heading up a Commons’ inquiry into pay and conditions for low-paid workers, said he believed workers at JD Sports were being “exploited”. 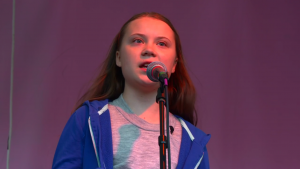 “I think they are treated like scum,” he said. Assist Recruitment said JD Sports spoke on their behalf. The JD Sports facility operates a high security system involving CCTV cameras, electronic fingerprinting, metal detectors and constant searches by security staff. Agency workers are advised to arrive early before their shift begins in order to clear the long security checks needed to get into the site. Over a five week period Channel 4 News filmed lines of workers waiting in the cold to enter the site. Workers are not paid for this time. 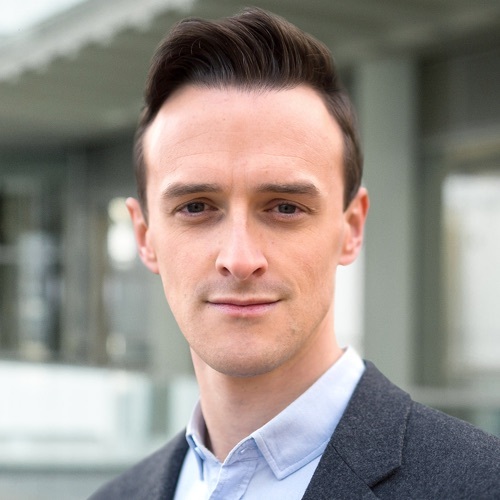 Assist staff told Channel 4 News’s reporter that workers who begin shifts even a minute after their allocated start time because of the delays had their records marked. “Lateness, lateness, lateness. 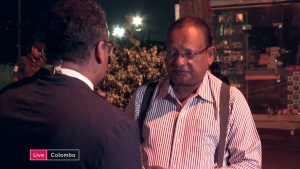 It goes against you,” a senior Assist Account Manager told our reporter. Delays can be even longer at the end of shifts, which for many workers comes at the end of a 12 hour day. Agency workers are told to clock out and then join long queues to go through security checks. It can take up to 15 minutes to exit the building. Staff go through airport-style metal detectors and are randomly selected for more extensive searches. Assist recruitment told Channel 4 News’s undercover reporter that the time spent going through this process is unpaid. Channel 4 News has calculated that agency workers are queuing to enter and leave the site for up to 30 minutes each day unpaid. These workers are effectively being paid less than the minimum wage. “If you’re not being paid for the end of your shift and walking out through security and your pay is somehow being deducted for that, you could be being paid less than the minimum wage. That is an absolute disgrace and that needs to be investigated further,” said Mr Wright. However JD Sports did not state whether that applied to agency workers taken on by Assist Recruitment. Assist Recruitment declined to comment independently. 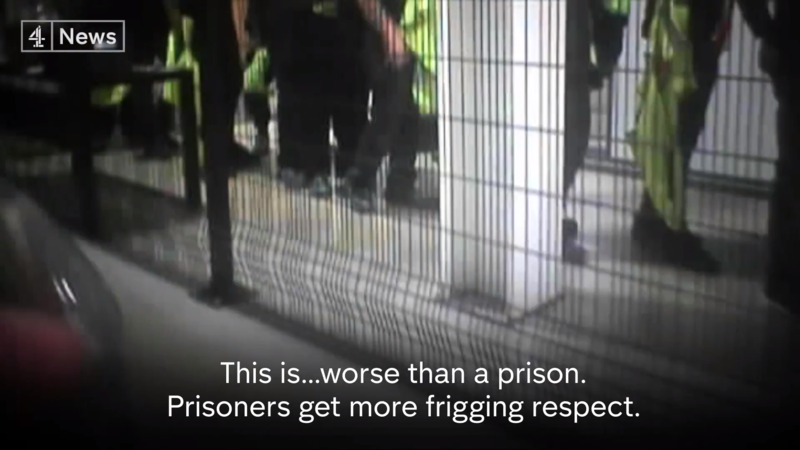 In their own words, workers employed at JD Sports’ Kingsway Warehouse are heard remarking the facility is “worse than a prison.” “Prisoners get more frigging respect,” one worker says. A female worker tells our reporter she “hates” her job and wants to work elsewhere. Iain Wright MP, Chairman of the Business, Energy and Industrial Strategy Select Committee told Channel 4 News he would be calling JD Sports to appear before the Committee. “I would like to see JD Sports in front of us. But what really worries me if i’m honest, this is getting to be a longer and longer list. The number of company bosses that have to explain their actions and explain their working practices, and explain why they use agencies that exploit, that abuse, is really getting longer. And we really have to deal with that. In a statement issued on behalf of JD Sports Fashion Plc and Assist Recruitment they added: “We are deeply disappointed and concerned by the allegations being made which we believe are misleading and not an accurate reflection of our culture, the vast majority of our people or our standards of practice and procedures. Indeed, we believe a large number of the allegations put to us by Channel 4 are plainly untrue. Our employees are vital to our business and their welfare is an utmost priority, so we take any such allegations very seriously. Once Channel 4 allow access to the footage and we understand the precise nature of any allegations that do prove to be accurate, we are ready and willing to investigate them fully at the earliest opportunity. Where there have been individual failures or breaches of our policies we will take appropriate action, and learn for the future. Have you worked for JD Sports at Kingsway? Please email C4investigations@itn.co.uk.